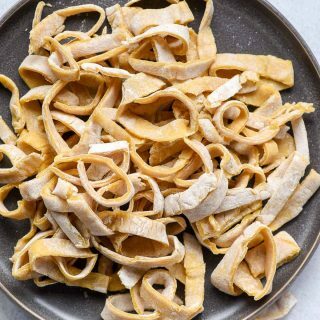 Easy Homemade Egg Noodles take all your favorite noodle recipes to the next level! Back then, I had no idea those simple chicken and noodles would become one of the most popular recipes on my site. It turns out this combo is much beloved in places throughout the Midwest. I have received comments from people in Illinois to Kansas, and have loved hearing how many of you have fond memories of your grandmothers making this special dish. Of course, when I first shared this recipe, I also had no idea how many people would find my use of store bought egg noodles downright offensive. Many of you grew up making your own egg noodles and couldn’t imagine using anything else. I grew up in an area with several local farm markets which sold Amish style egg noodles, so my family always *gasp* bought our egg noodles locally. Truth be told, I never really thought to do anything else. However, after so many of you told me how much better homemade egg noodles are, I decided it was time to give it a try. I pulled out two of my favorite Amish and Mennonite cookbooks and scoured my own comment section for family recipes readers had shared. 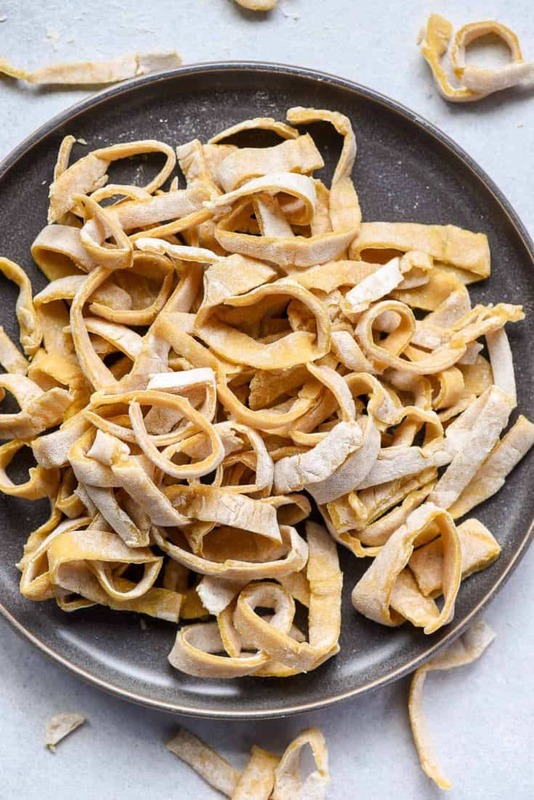 What are Homemade Egg Noodles made of? As it turns out, making your own noodles isn’t very difficult, even for a complete novice like me! It requires only three staple ingredients: eggs, flour, and salt plus a little water. It takes about 20 minutes of hands on time to whip up a batch of noodles, but I’m sure with practice, you could probably make them even faster. I put together a quick tutorial to help you through the process, so you can enjoy truly made from scratch noodles any time the craving hits. 1. Start by whisking together 3 egg yolks, 1 whole egg, a few Tablespoons of cold water, and a teaspoon of salt. 2. 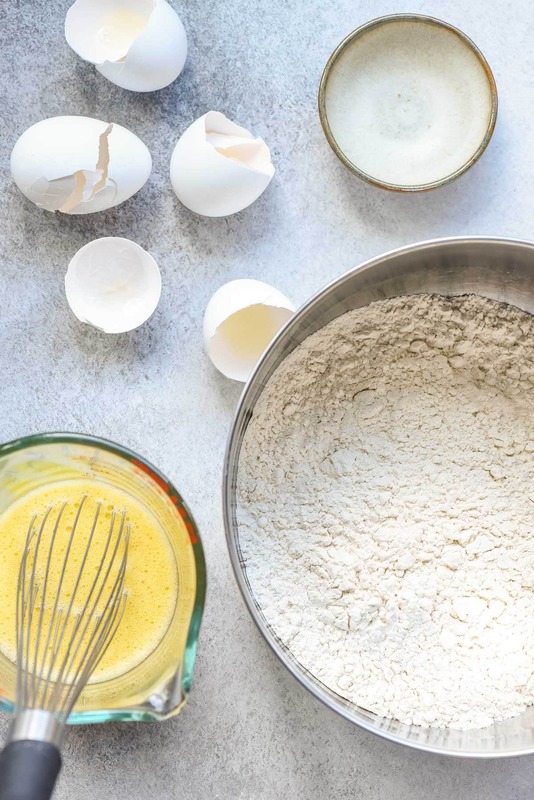 Add the mixture to a bowl with 2 cups of flour and use a wooden spoon to stir the mixture together until a shaggy dough forms, adding additional water until it comes together. 3. At this point, the dough will likely be pretty sticky. 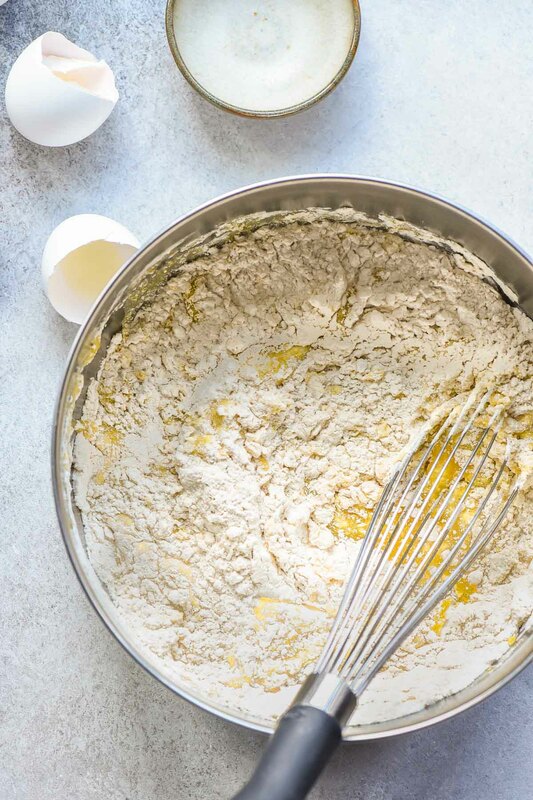 Turn it out onto a well floured surface, sprinkle a little flour on top, and use well-floured hands to knead the dough until a smooth ball forms. (Sorry I forgot to take a picture of the smooth ball–you’ll have to trust me on that one). Divide the dough into two balls and place them on a well floured surface. Flour a rolling pin, and roll the dough out as thin as possible. If the dough springs back when you try to roll it, let it rest for 5-10 minutes, then try again. 4. Once rolled out, the dough will need to sit and dry for about 40 minutes to 1 hour, or until slightly dry, but still pliable. 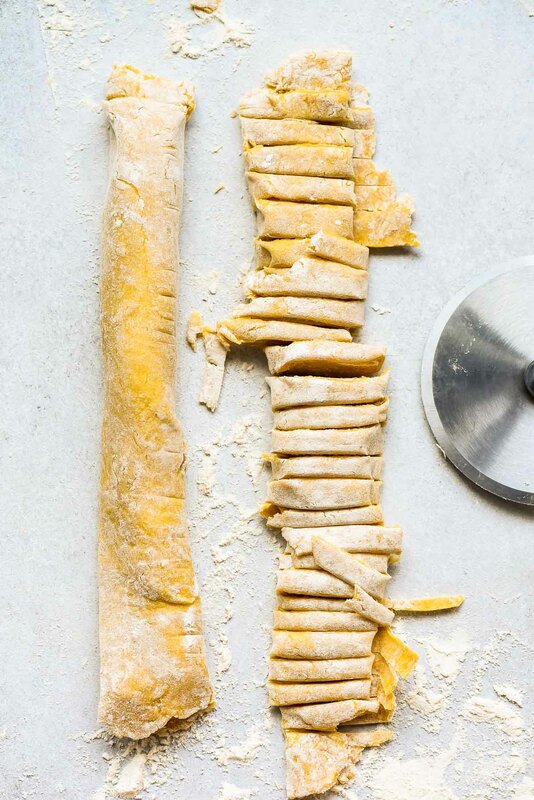 From here you can use a pizza cutter to cut strips to your desired width, or roll the dough up jelly roll style and cut with a pizza cutter (I find it easier to get straight, even cuts with this method). If you want shorter noodles, cut the circle in half before rolling up. 5. From there, lay out the strips on a cooling rack and allow to dry completely. 6. 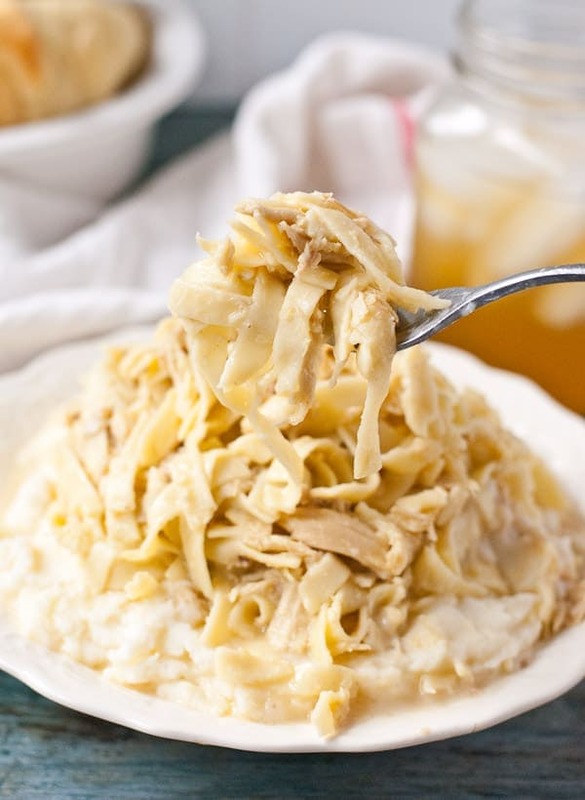 Once the pasta is dry, it can be stored in an airtight container for up to a month, or, drop the noodles straight into boiling broth to make the best Amish chicken and noodles. After making my own noodles, I can honestly say it DOES make a difference, and they are better than store bought. And I was pleasantly surprised how easy they are to make. Seriously, ANYONE can do this! However, I’ll probably still rely on good quality store bought egg noodles for days I don’t have the extra hour and a half to make and dry my own. For special occasions, or when I really want to pull out all the stops, it’ll be homemade noodles from here on out. I can’t wait to try them in my 30 Minute Homemade Chicken Noodle Soup! Wondering what to do with your leftover egg whites? 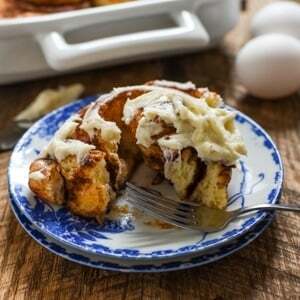 Check out my collection of Leftover Egg White Recipes! 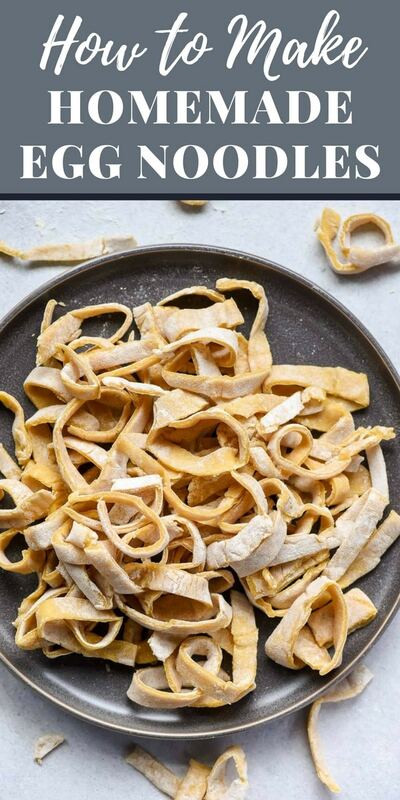 This simple recipe yields rich homemade egg noodles. Whisk together the egg yolks and egg until lightened in color. Whisk in 3 Tablespoons water and salt. 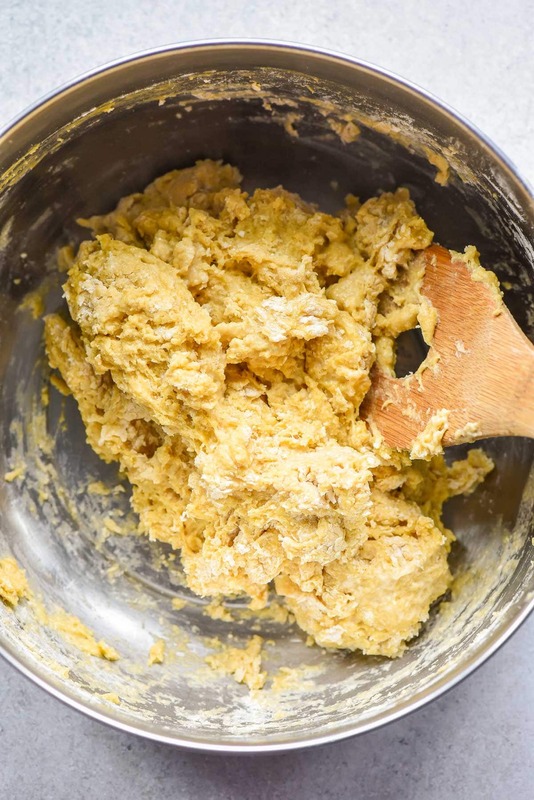 Add the egg mixture to the flour and work together with a wooden spoon until a shaggy dough begins to form. If the mixture is too dry, add an additional Tablespoon or two of water until it comes together. At some point, you'll likely find the spoon isn't cutting it and you'll want to turn the dough out onto a well floured surface and use your hands to knead the dough until smooth, about five to ten minutes. Re-flour your surface if needed, then divide the dough into two balls. 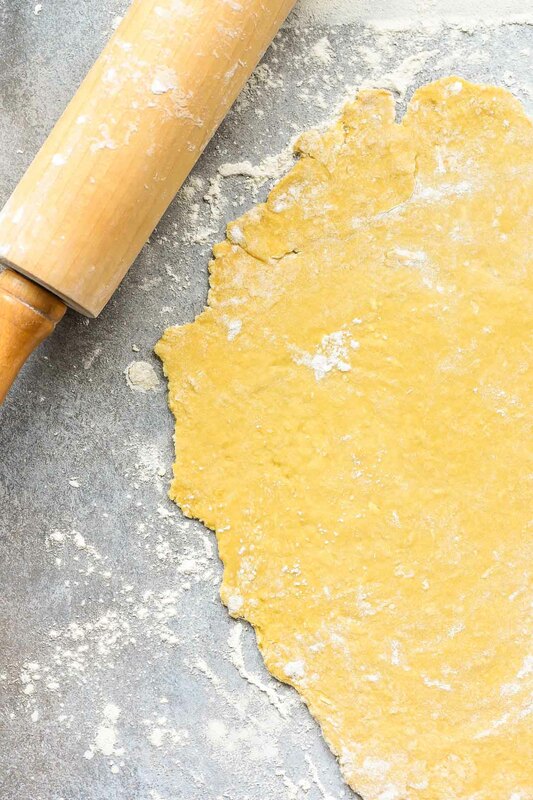 Using a floured rolling pin, roll each dough ball out into a thin circle. Allow the dough to dry until no longer sticky but still pliable, about 40 minutes to 1 hour. From here you can either use a pizza cutter to cut long strips to the desired width, or roll each circle up like a jelly roll (I roll starting on the long end) and cut using the pizza cutter. I find the rolling method easier to get even strips, but it's totally personal preference. Lay cut strips out on a cooling rack to dry completely. Store in an airtight container for up to 1 month. When ready to cook, drop into boiling water and cook for 10-12 minutes or until soft but still a tad chewy (NOTE: cooking time will vary based on the width and length of your egg noodles). 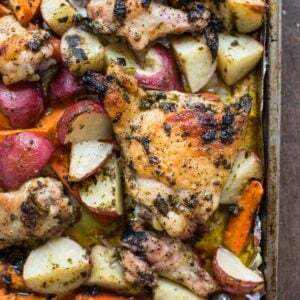 This recipe makes a perfect amount for a big batch of my Amish Chicken and Noodles or a large pot of chicken noodle soup. Hi Courtney. These noodles look so delicious and your instructions make it sound like even I might be able to make them. One question; If I’m going to make them and then put them into a recipe on the same day (like your recipe for the Amish Chicken and Noodles), do I still have to wait for them to dry first? They don’t have to be completely dry, but should be dry enough that they aren’t sticking together! If you are going to store them for a few days, do they need to be kept in the fridge? My family will leave them out to dry completely – however ours are a bit thinner. But tossing them in flour and storing in freezer bag in the freezer is better than fridge. Since they’re still soft in the fridge they seem to absorb more of the flour and will stick together. I love hearing about everyone’s family recipes. This definitely seems to be one that’s passed down. the article is about noodles, the recipe is for pancakes. where’s the noodle recipe? Whoa! Thanks for catching that. Something really wonky happened there, but it should be all fixed now! Please let me know if you still can’t see the egg noodle recipe. I grew up with home made egg noodles. I remember them being rolled out paper thin to dry. It took up our whole kitchen table. Then Mom rolled them up and cut them about 1/4″ thick. I got the pleasure of unrolling them and dropping them in the hot chicken and broth while standing on a chair. Such wonderful memories. My son’s 34 and he has never had home-made. I feel so guilty now. But he will very soon. Thank you for bringing back memories. Where do I get a noodle drying rack? We use a coat hanger. Works great! Can you use almond flour or coconut? I have not tried either of these, but I definitely wouldn’t recommend coconut flour, as it soaks up a lot more liquid than traditional flour.